Are you trying to save a little money when it comes to servicing your car in Seaford? Take a look at these great car parts specials. Keep your car and wallet happy at the same time! Just print one off and bring it in today! Restrictions apply. See participating Toyota dealer for details. Offer valid on select brands. OEM, OEA and WIN replacement tires only. Tires must be dealer‑installed. Three tires at regular price, fourth tire for one dollar. Fourth tire must be of equal or lesser value. Excludes mounting and balancing, sales tax, shop supplies, tire disposal, and other applicable taxes. Excludes previous purchases. Toyota and Scion vehicles only. 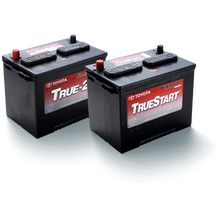 Offer only available at participating Toyota dealers 04/01/19 − 4/30/19. $125 - Includes 84 month warranty! • Some Camry, FJ Cruiser, Avalon, Sequoia and Tundra models may be slightly higher.